In other words, from my White 2037—the ratty slipper of the sewing machine world—to a Pfaff Tiptronic 1171—the sleeker, chunky-heeled sister. Seriously, these are the illustrations in each respective owner's manual. The beslippered foot always seemed to make sewing look a bit frumpy, so leave it to capitalist West Germany to glam up the housework. 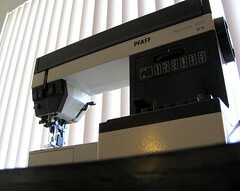 I scored the Pfaff at a thrift store a while ago and haven't mentioned it because it's been getting repaired ever since. Just as I got her back, I found the new Zigzaggers blog (via Craftzine), so I sent in a review of the 1171. Check it out to hear me gushing, and take a look at all the beautiful secondhand machines other people have written about. Suweet! I love the way you've dramatically photographed it from below and to the right -- it looks freaking MONUMENTAL! This fall should be new machine time for me, if all goes well. Can't wait. Occasionally companies will send me products to review or materials to make something out of. When this is the case, it will be noted in the post. I strive to present useful information, techniques, and projects with these posts and will not post advertising for its own sake, but please do support the sponsors if you've enjoyed the post. 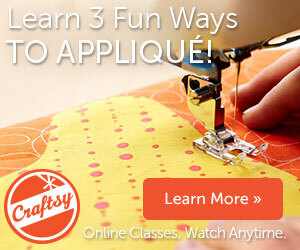 Affiliate links are sometimes included to help defray the cost of managing my website. Text, photos, and original project designs © Feed Dog Designs.